Back in the ‘90s when I worked for the government, the buzzword for federal managers was “Total Quality Management,” or TQM. TQM is all about improving business processes and achieving greater efficiency. One of the things I learned from various TQM projects is that each step in a process needs to be looked at to see what value it adds to the overall product. In many cases, it was possible to eliminate multiple levels of approval for something, leading to a speedier process without increasing the risk of problems; the steps that were eliminated were ones that did not add value to the process. The idea of how value is added to something has other, broader applications as well, and those are some of the things we are exploring in this issue of UND Discovery. North Dakota is known nationally for valueadded agriculture. For example, we make pasta out of our durum wheat and frozen french fries from our potato crop, thus adding value to the product before we sell it out of state. Our focus in this issue is on yet another kind of added value. How do the expertise of UND’s faculty and our broad research portfolio provide added value beyond the curricular offerings of the University? The value-added aspect of UND’s research ranges from weather forecasting to pharmaceutical development, from managing rural health care to managing soil erosion. Much of the added value comes from the collaborative spirit of our faculty and students, who work with researchers from other universities, private companies, and scientists from federal agencies such as NASA. By teaming with others who have complementary skills and knowledge, we can get the most bang for our buck and the most value from our research and scholarly work. There’s another, less obvious, added value for our students. It’s been shown that when students are engaged in real research projects, they are much more likely to stay in school and complete their degrees in a timely way. Even freshmen can be involved in research, whether it’s in a lab or a historical archive. Either way, what could be more exciting than discovering new knowledge — being the first person to know a particular thing! UND has a high level of research participation by undergraduates, and we all love seeing them have those “Eureka!” moments. On a personal note, this will be my last letter for this magazine. I will retire from UND at the end of June, and I know that one of the things I will miss is the daily contact with faculty and students who are engaged in discovering new things and adding value to what the University does. I will be staying in Grand Forks, and I will continue to be committed to supporting this great university, my alma mater. Three cheers for Dr. Phyllis Johnson! You will usually find her letter before mine on the inside cover of UND Discovery editions, just like this one. As vice president for research and economic development, Johnson also acts as publisher of this magazine and has been doing so since she came to UND in 2009. She has guided nine successful editions (twice a year, spring and fall) of UND Discovery, the University’s only publication dedicated exclusively to research, creative activity and economic development originating on campus. But this edition is her last. A long-planned and well-deserved retirement for Johnson is on its way. And as editor of the magazine, in the Division of University & Public Affairs, I’d like to use this space to extend our heartfelt thanks to Dr. Johnson and her staff for their efforts to help make this magazine a fresh and compelling representation of what is taking place in laboratories, offices, and scholars’ workshops across campus. We often receive positive feedback from across the state and nation on the storytelling, imagery, and, of course, the interesting research and creative activity that is detailed in these pages. In the last issue, we got a chance to tell the story about Johnson’s early involvement in UND research — as one of a group of grade schoolers who volunteered to be part of a study — on whether exposing children to typing impacted their academic progress positively or negatively, compared to a control group that maintained a traditional writing regimen as part of their education. The study was featured on national television and young Phyllis Johnson got her picture in the Grand Forks Herald and other newspapers nationwide. Fast forward a few years: Johnson was still delving into the sciences as a chemistry major at UND. She earned her bachelor’s degree from UND in 1971 and her doctorate in physical chemistry, again from UND, in 1976. She ended up heading down Second Avenue North a short ways to do her post-doctoral work at the Grand Forks Human Nutrition Research Center (HNRC). That launched her on a distinguished career with the U.S. Department of Agriculture’s (USDA) research arm. She would serve as a research chemist and a research leader for nutrition, biochemistry and metabolism at the Grand Forks HNRC before serving as the associate director of the Pacific West Area USDA Agricultural Research Service (ARS) in California. Along the way, she also worked as a clinical instructor in internal medicine at the UND School of Medicine & Health Sciences. Eventually, Johnson was named director of the Beltsville Area USDA ARS, where she managed a broad range of research from entomology to genomics to remote sensing. Under her direction, USDA’s flagship research center led the USDA in biofuel and bio-based product utilization and received three White House awards for these and other environmental activities. She was co-chair of a federal interagency working group developing science policy related to scientific collections as critical national research infrastructure. She continues to lead this effort internationally. Johnson was also recognized by President Clinton as being in the top 5 percent of senior executives across the federal government. So as we pieced together this latest edition, with its “Value Added” theme — as in, how does UND research and creative activity add value to life in North Dakota and beyond? — I thought it only fitting to celebrate the value that Johnson has added throughout her career in the name of science. Thank you, Dr. J. 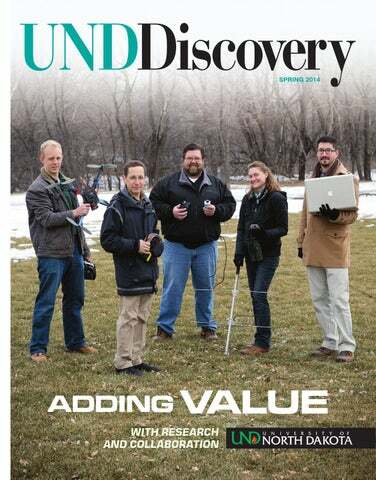 In this issue of UND Discovery, we’re focused on all things valueadded. In other words, we’re highlighting ways UND’s researchers and other creative thinkers enhance the world in which we live. Do these efforts add more comfort or convenience to our lives? Do they make us safer, healthier or smarter? Do these efforts invigorate our society and economy? These are but a few of the measuring sticks we could use to gauge how UND research and creative activity make us better. Unmanned aircraft systems (UAS) is a rapidly growing field with great potential for North Dakota. UND is at the forefront of developing sense-and-avoid technology to improve safety for both manned and unmanned aircraft. Above, UND research pilot Jonathan Sepulveda and UAS lead instructor Trevor Woods (left and center, respectively) review plans with NASA Langley Research Center pilot Rick Yaskey for a flight mission to test this sense-and-avoid software developed at the University. The story is on Page 6. Leon Osborne, a UND atmospheric scientist, helped revolutionize the way travelers plan trips and stay ahead of Mother Nature. Find out how he did it on Page 4. And UND School of Medicine & Health Sciences faculty members David Bradley and Jyotika Sharma are working on advances to control certain deadly infections and dangerous human diseases. See the stories on Pages 13 and 17. These are just a sampling of the “value-added” stories you’ll find in this issue, thanks to UND researchers and creators! 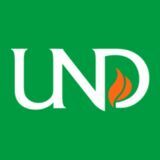 UND Discovery is published by the Office of the Vice President for Research & Economic Development, with assistance from the Division of University & Public Affairs. Editor: David Dodds. Contributors: Juan Miguel Pedraza, David Dodds, Denis MacLeod, Amy Halvorson, Kate Menzies, Alyssa Wentz, Kallie Van De Venter, Kortnie Evanson, and Chen Wu. Principal photography by Jackie Lorentz and Shawna Noel Schill. Please send inquiries and comments to the Office of the Vice President for Research & Economic Development, University of North Dakota, 264 Centennial Drive Stop 8367, Grand Forks, ND 58202-8367. The University of North Dakota is an equal opportunity/affirmative action institution. 2	Qualtrics and responsibility: Powerful tools for data collection create a need for ethical responsibility. 3	The art of farming: An unlikely collaborator assists in an art exhibition. 4	The people’s weatherman: Leon Osborne revolutionized the dissemination of weather information. 5	Shedding the sticky notes: TruServeTM helps health agencies track and report activities. 6	Friendly skies: Sense-and-avoid technologies promote safety for manned and unmanned aircraft. 7	Air support: Interdisciplinary efforts and UAS technology combine to enhance wildlife research. 8	What was old is new again: Historical parallels can help officials manage the challenges created by rapid development in the Bakken region. ON THE COVER: An interdisciplinary team of UND researchers applies several forms of technology to improve wildlife tracking and management. See the story on Page 7. Photo by Jackie Lorentz. Powerful tools to uncover a wealth of consumer and scientific data also create a need for significant ethical responsibility. combine from a cattle prod, convinced Fortin to join him as a consultant for the show. “I told him that I needed him; I needed his advice,” Jones said. “I told him that I wouldn’t know even half of what I was looking at.” Fortin realized the art professor might be in a bit over his head when he described the Fortin family’s 300-acre farmstead, which got its start in the 19th century. It sounded like a vast territory to Jones, whose idea of large tracts of land was measured in city blocks. “Where I come from, that sounded like an awful lot of land to me,” Jones said. He was astounded to learn later that some farmsteads in the region can be as large as 6,000 acres or more. John Fortin (blue shirt) shows a certificate bearing an “Honorary ‘A’ in Art” that was presented to him at a Jan. 29 reception in As the art show began to develop, appreciation for his consulting work on “The Farmers’ Choice” exhibition in the UND Art Collections Gallery at the Empire Arts Center. Jones noted, more and more connections between the community and agriculture became evident to him. He had set out to inspire people through art, using agriculture as the touchstone, but at the same time, it was as if Jones was having an epiphany of his own when it came to agriculADDING ture’s value to the people of this region. Jones decided to name the exhibit “The Farmers’ Choice,” a play on the theme and the site — Choice Health and Fitness — where he was inspired to pursue the exhibit. Along the way, Scott Telle, a local businessman and graphic design instructor for UND’s Department of Art & Design, learned of Jones’ plans and asked him to meet with leaders at Choice Financial, a regional banking firm that had obtained naming rights to the fitness center. Choice Financial became enthusiastic about the show. The firm’s connection to the show became even more fitting, Jones said, By David Dodds when he learned about the bank’s history as a major lender to farmers Art Jones has spent a career making visual art relevant to people — of the region. even if they don’t realize it at first. “The Farmers’ Choice” exhibition, which ran at the Empire from So it’s not surprising that an innocent exchange of locker banter at Jan. 29 through April 1, featured 28 pieces, including paintings, prints, a local fitness club between Jones and an admitted art-agnostic farmer ceramics and cultural artifacts. Most dated from the 1930s onward, would eventually lead to a full-blown exhibit at the University of with the majority produced in the region, but the show also featured North Dakota Art Collections Gallery at the Empire Arts Center. The a sculptural object from ancient Greece, works on paper by 19th best part is that Jones was able to recruit a nonbeliever in art to be a century French artists Honoré Daumier and Jean-François Millet, and co-consultant on a major art project. a color lithograph by 20th century French cubist Fernand Léger. It all started when Jones, chair of the UND Department of Art & In addition to Fortin and his farming background, Jones also Design, met local farmer John Fortin in the locker room of the Choice leaned on other co-consultants, people such as Emily Burkland, execHealth and Fitness Center in south Grand Forks. The two struck up a utive director of the Empire Arts Center; Dawn Botsford, an events conversation about what each other did for a living, and the talk soon coordinator at UND; and Patrick Luber, a professor and sculptor at led to Fortin’s college days decades ago at Mayville State University. UND Art & Design, all of whom grew up on family farms. Fortin lamented how he was forced to take an art appreciation Jones says that his and Fortin’s chance locker room meeting has class at Mayville State and that it was the hardest course he ever had grown into a friendship. It has also spawned an incredible collaborato take. tion from which both men and the community are benefiting. “As I recall, John (Fortin) joked how ‘he liked it so much, he took it During “The Farmers’ Choice” public reception Jan. 29, Jones surtwice,’ ” Jones said. “This was his way of telling me that what I did had prised Fortin with an award certificate — an academic achievement very little relevance in his life.” award — that announced Fortin had earned an “Honorary ‘A’ in Art” The ribbing stuck with Jones and got him thinking about what as a gesture of appreciation for his work on the exhibit. he could do to turn Fortin’s disappointing college experience into an “John seemed happy to receive it,” Jones said. “He was showing it opportunity to change his mind about art appreciation. to people all night at the reception.” n To do it, he had to make the artworks relevant, Jones thought. TruServeTM, a UND-developed software, helps rural health offices across the nation track activities and prove value. The TruServeTM team at the Center for Rural Health (CRH) includes (left to right) Barry Pederson, Web developer; Kelly Quigley, program coordinator; Maren Niemeier, information resources manager; and Kristine Sande, CRH associate director. UND is adding value to the field of aviation by helping aircraft talk directly to each other with new sense-and-avoid technology. Team effort UND UAS-related partnerships include microelectronics and coatings research taking place at NDSU in Fargo. An interdisciplinary team of UND researchers uses their combined expertise to solve wildlife management challenges with the help of UAS technology. This is one of numerous scenes shot by Kyle Cassidy for the North Dakota Man Camp Project. His photographs documented the many efforts to create housing in the Bakken region during the dramatic expansion of oil and gas development. Historical parallels can offer insights for today’s challenges in the Bakken region. William Caraher (left), associate professor of history, and Sebastian Braun, chair of UND’s Indian Studies Department, are among the scholars who are discussing the impact of oil development in the Bakken formation on the region, including the Fort Berthold Indian Reservation. An international duo forms a unique System Dynamics collaboration for their work on issues with North Dakota’s oil and gas producing region. A “dynamic” exchange By David Dodds Eduard Romanenko is on his second academic journey into the heart of the United States. The first time around, the native of Vladivostok, Russia, was on an exchange opportunity to Lawrence University in Appleton, Wis. He did, however, have a couple of pals who ventured farther west to schools in North Dakota. “I heard different stories from them about the temperature extremes, and back then, I thought I would never come to a place like that,” said Romanenko, who received his bachelor’s degree in international economics from Far Eastern Federal University in Vladivostok, a city on Russia’s Pacific coast near China, Japan and South Korea. A lot has changed since then. UND graduate student Rick Thalacker uses high-resolution GIS data to pinpoint soil erosion, keeping North Dakota fields arable and reservoirs flowing. Back on campus, Rick Thalacker runs hydrometer tests on water samples. Matt Illies, a UND graduate student in paleontology, inspects the core samples he is polishing for the digital Continental Resources High Resolution Virtual Core Library Project. The samples are meticulously sanded and polished, and then photographed with specialized equipment to record the maximum amount of visual information. Illies is polishing rock samples from the Formation Devonian-Winnipeg 0515 Formation. Photo by Jackie Lorentz. UND immunology professor David Bradley (left) is consulting with NovaDigm Therapeutics’ on-site research administrator Clint Schmidt on the firm’s efforts to develop a vaccine against hospital-acquired, or nosocomial, infections. Cave-seeking behaviors may offer insights to early human development. a comparative model for understanding some aspects of human and other primate ecology and behavior. Early humans were also subject to non-tropical environments and were forced to live with extreme temperature swings across the different seasons. Previously, it was often argued that cave use by anthropoid primates (monkeys and apes) was to help regulate temperature. But Cuozzo and his colleagues’ new lemur information suggests that these primates are using caves as sleeping sites to avoid native and introduced predators. These new data provide a framework for interpreting possible cave use by early human ancestors and other extinct primates, indicating their potential use of caves for protection from predators, similar to the ring-tailed lemurs described by Cuozzo and colleagues. Since more people are populating Madagascar, new predators such as dogs and cats have emerged. This has posed a new threat to the lemur species. Cuozzo said that caves found along the ground could be considered traps for lemurs if being chased by predators. As shown in this research, only caves found high on cliff faces, where predators can’t climb, are chosen by these lemurs as sleeping sites. Research efforts are ongoing for the study of this ring-tailed primate. Cuozzo is among those leading efforts to find answers for this recent change in primate behavior. The work of Cuozzo and his colleagues was funded by various sources, including a UND Faculty Seed Money Grant, the University of Colorado-Boulder, Colorado College, The Natural Sciences and Engineering Research Council of Canada, The National Geographic Society, and the U.S. National Science Foundation. n Photographs courtesy of Frank Cuozzo. Jesse Rhoades is exploring how the natural tendency of students to form their own social networks can be utilized to create better teaching strategies. These might also suggest more effective ways to mediate bullying or other behavior issues. William Martin: The “source” seems to matter more when considering positive opinions, compared to negative ones. The National Institutes of Health has awarded a two-year grant to Assistant Professor Jyotika Sharma (second from left) for an investigation of the respiratory infection popularly known as “rabbit fever.” Her research team includes (from left) undergraduate student Brandilyn Binstock, Assistant Professor Bibhuti Mishra, and third-year Ph.D. student Anthony Steichen. RABBIT FEVER A team of faculty and student researchers investigates this debilitating disease with the goal of identifying a pathway to a vaccine. ponized and used by bioterrorists. When harmful bacteria invade the body, the immune system recognizes the antigens or chemical flags on the surface of the bacterial cells that tell the immune system the cell is foreign. The immune system mounts a defense by preparing antibodies to attack and repel the infection. But if the immune response is ineffective or weak, the body will succumb to the infection. If caught in time, Francisella can be combatted with antibiotics; however, given the widespread and deadly nature of the bacteria, vaccination before infection would be optimal. “The NIH has poured in millions of dollars so far to get a vaccine made against this infection,” Sharma said. “While it has vastly improved our knowledge about how this disease is caused, we are still far from formulating an effective preventive strategy.” Assistant Professor Bibhuti B. Mishra is a co-investigator and collaborator with Sharma. Their team working on this project also includes Anthony Steichen, a third-year Ph.D. student, and Brandilyn Binstock, an undergraduate student. BOOK NOTES Languages professor Paul Worley examines the importance of the oral tradition in understanding the Maya culture and its relationships with Mexican and global cultures. “Found” in translation Award-winning writer Elizabeth Harris immerses herself in a literary art form that enriches how people view the world. •	Last November, he was an invited plenary speaker at the NSF’s annual national EPSCoR (Experimental Program to Stimulate Competitive Research) conference in Nashville, Tenn. •	In January, he visited colleagues at the California State Polytechnic University at Pomona to discuss collaborative research and education projects as well as to recruit students to UND programs. •	In April, he gave an invited seminar talk on renewable transportation fuels and chemicals at the University of Maine in Orono. If that isn’t enough, Seames already has two papers accepted at a coal conference in the United Kingdom next September, and is being considered for a prestigious Gresham Lecture in London next winter. Wonderlich awarded grant for new therapy study Steve Wonderlich, Chester Fritz Distinguished Professor of Clinical Neuroscience at the School of Medicine & Health Sciences, recently was awarded a National Institute of Mental Health (NIMH) grant to study a new treatment for binge eating disorder developed by investigators from UND and the University of Minnesota and the University of Wisconsin. In the United States, 20 million women and 10 million men suffer from a clinically significant eating disorder at some time in their lives, including anorexia nervosa, bulimia nervosa, binge eating disorder, or related disorders, according to the National Eating Disorders Association (NEDA). Wonderlich — with a team that includes researchers from the Fargo-based and UNDWonderlich affiliated Neuropsychiatric Research Institute (NRI) and colleagues at the University of Minnesota — will be conducting closely supervised trials of the new treatment with volunteers who suffer from binge eating disorder. Wonderlich and his research colleague, NRI president and Chester Fritz Distinguished Professor and Chair of Clinical Neuroscience James Mitchell, are known globally for their pioneering research and clinical work with eating disorders. The grant from NIMH, which is part of the National Institutes of Health, is part of a longer-term strategy to uncover better ways of treating this disorder. Ingle uncovers, publishes groundbreaking trumpet pieces UND Trumpet Professor Ronnie Ingle edited and compiled a groundbreaking edition of music that has been published worldwide by Carl Fischer Music, leaders in educational publishing and arguably the largest music publisher in the world. Ingle recently discovered a collection of solos for trumpet and chamber orchestra composed by notable trumpeter Francois Dauverné, the first trumpet teacher at the famed Paris Conservatory. He then transformed the works for solo trumpet to a modern edition for solo trumpet and piano. Dauverné’s solos were known to exist through references from other sources, but the music itself was not located or available until Ingle managed to track it down. Now with Ingle’s publication, the music world has access to several masterpieces of trumpet literature by one of the most important Ingle figures in the history of that instrument. The modern edition is more than 120 pages, and includes parts for piano and trumpets in B flat and C. The book also contains a recording of these works played by the UND maestro himself, Ingle. Ingle devoted the last three years to transforming this historical piece to one with a modern flair. Though Ingle is not one to toot his own horn, Carl Fischer explains in its press releases that “this is a collection that all trumpeters should have in their library.” Ingle has been playing trumpet for more than 30 years and has earned degrees from the University of North Carolina at Greensboro (D.M.A. ), Webster University in St. Louis (M.M. ), and Western Carolina University (B.A.). He currently serves as trumpet instructor and director of the UND Trumpet Ensemble. Caine named co-editor of sports medicine series Dennis Caine, professor and chair in UND’s Department of Kinesiology & Public Health Education (KPHE), part of the College of Education & Human Development, was named series co-editor for the long-standing Karger Publisher’s (Basel, Switzerland) book series, titled Medicine and Sport Science, on Jan. 1. Caine also currently serves on editorial review boards for three other journals: British Journal of Sport Medicine (associate editor), Clinical Journal of Sport Medicine, and Research in Sports Medicine: An International Journal. Prior to coming to UND, Caine was a Caine professor in the Department of Physical Education, Health and Recreation at Western Washington University in Bellingham from 1992 to 2007. He began his career as a physical education teacher in Canada and with the Canadian Department of National Defense in Germany. Caine’s research interests involve the epidemiology of injury in sport, injury and growth, and the effects of intensive training on growth. Within KPHE, Caine teaches Applied Motor Development at the undergraduate level and Physical Activity Epidemiology for graduate students. Deans discuss Indian gaming trends at Stanford Law School Conference UND Law School Dean Kathryn Rand and Interim Dean of the College of Nursing & Professional Disciplines Steven Light recently participated in a conference on Indian gaming Rand trends Feb. 6-7 at Stanford Law School in California. Titled Contemporary Issues in Indian Law, the conference was organized by the Stanford Native American Law Student Association. Rand and Light, who also serves as UND’s associate vice president for academic affairs, spoke as part of a panel on Tribal Gaming and Tribal-State Compacting. Their presentation was titled, “Tribal Gaming Issues in the 21st Century.” Light In related news, Rand and Light’s research in Indian gaming issues around the nation continues to attract bigtime media attention. The research duo was cited in a March 4 New York Times story on the rise of intertribal disagreements over the expansion of Indian gaming in California. The Farmers’ Choice exhibition at the UND Art Collections Gallery included this untitled 1934 oil painting by Thorarin Snowfield (1897-1981) depicting a threshing scene. A native of Mountain, N.D., Snowfield studied art in New York City and Minneapolis. During the Great Depression, he created paintings of North Dakota “native scenes” for the Works Progress Administration (WPA). After the closing of the WPA, he made a modest living as an artist in Cavalier and Langdon, N.D. Creating scenes of Icelandic life in North Dakota during the early and middle 20th century, Snowfield is the only known artist who painted scenes from this portion of the state’s history.